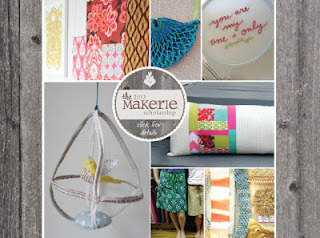 You all know how excited I am to join the Makerie Sewing retreat next April in Boulder. And I would love for as many as you can to join us there for the amazing experience! To help get one of you there, the incredibly generous folks at The Old Glory Antiques Fair are offering a scholarship for one full Makerie Sewing package (complete with a travel stipend of up to $500). That is really pretty phenomenal! And I love that the application process is consists of, in part, creating a quilt block out of paper. I sure hope that we'll be able to see some of the entries! For complete information on the scholarship, including eligibility and the application process, please visit the Makerie blog here. But hurry, you only have until November 5th to submit your application, so get to it. Good luck!